Reader Richard D. Shay kindly commented on my “excellent detective work” in turning up detail on Amazon’s meteoric growth. Thank you. 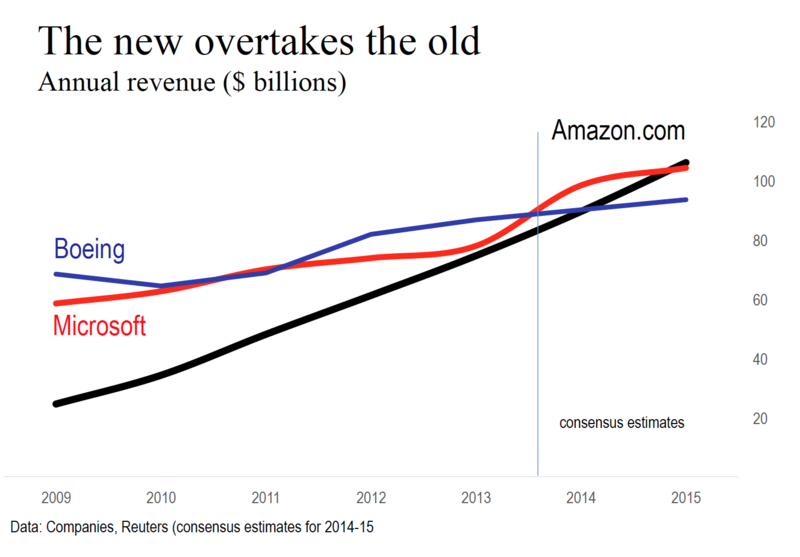 In preparation for a recent presentation, I updated four Amazon.com charts. As I noted here, Amazon won’t disclose its Seattle-area employment. 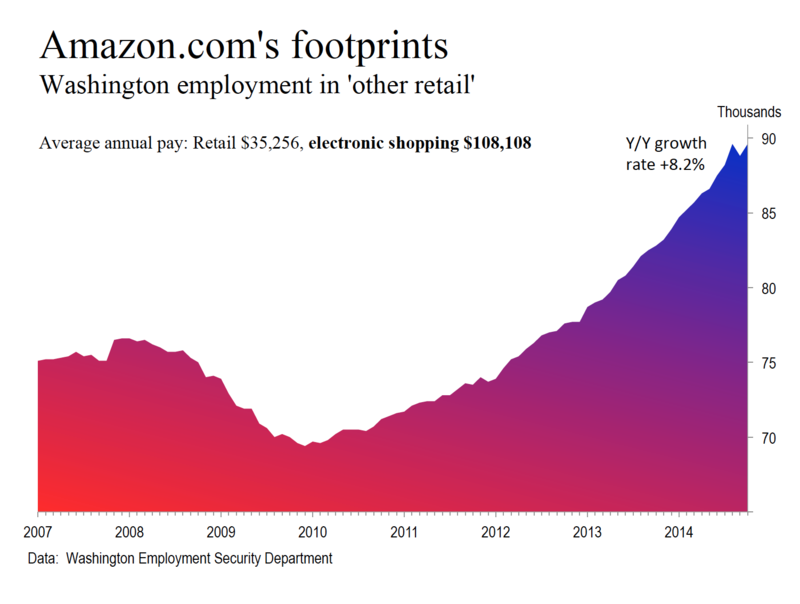 I see its footprints in data compiled by the Washington’s Employment Security Department. These footprints are illustrated in the top-most chart. 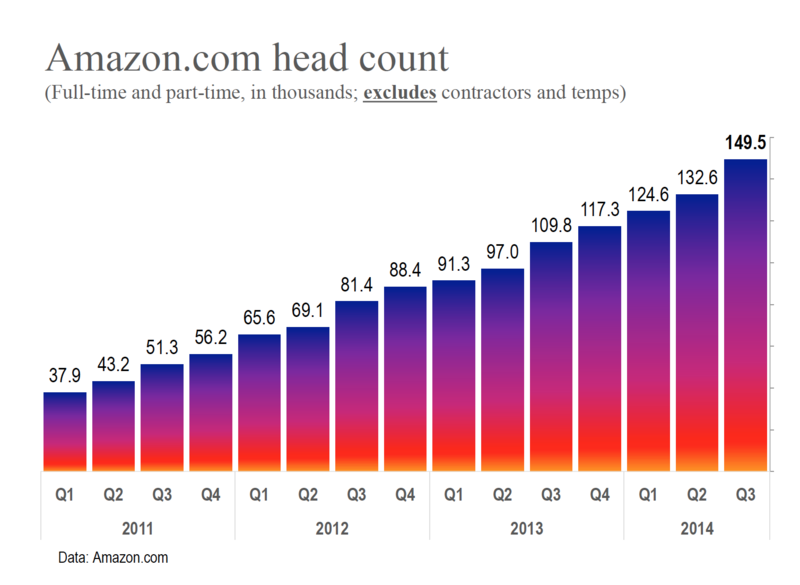 The company’s head count has increased nearly four-fold in less than four years. This helps explain its explosive demand for office space in Seattle. The company is literally remaking downtown Seattle and South Lake Union. 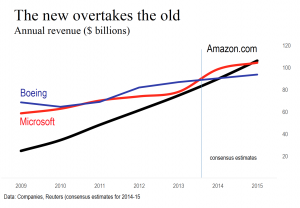 Amazon’s revenue is set to overtake that of both Boeing and Microsoft next year. Margins and profits are another matter. S&P Capital IQ reports that the company’s return on revenue is a miniscule 0.4%, lower by a factor of four than peers such as 1-800-FLOWERS.com. 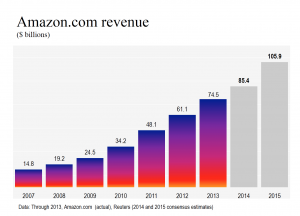 Competitor Priceline Group, roughly a third the size of Amazon.com on the top line, returns nearly 28% on each dollar of revenue. 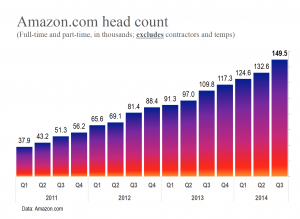 Wall Street has largely given Amazon a pass on its lack of robust profitability. At least until this year. The stock today trades at roughly 25% below the high reached in January.